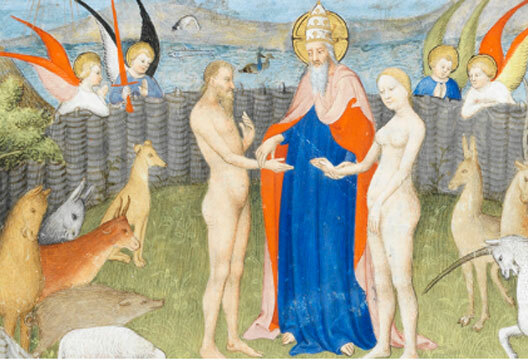 'Colour: The Art and Science of Illuminated Manuscripts', an exhibition at Fitzwilliam Museum Cambridge, reviewed by Professor Charles Fernyhough (University of Durham). We think of the Middle Ages as a drab time. The Monty Python image of the filthy peasant, dressed in brown homespun, fits with a preconception of ravaged bodies and benighted, superstitious minds. But a stereotype that would have been practical reality for many belies the period’s deep attraction to all that was bright and vivid. When funds allowed it, medieval houses were painted, clothes dyed and colour used as a language to encode spiritual and worldly meanings. Over hundreds of years, the colours have mostly faded. They blaze on in the stained-glass windows of Gothic churches, but such fragile works of art were vulnerable to the depradations of the Dissolution and other upheavals. Densely valuable, portable and discreet, books could be hurried out of sight when trouble came. The medieval codex has proved remarkably resilient: perhaps a million such manuscripts survive, many of them illuminated. You could argue that only on their pages do the true colours of the Middle Ages shine through. Manuscript illumination was traditionally considered a secondary art. Paintings in books served very practical purposes, bringing the stories of the Bible alive to the illiterate masses. The early missionaries to England would literally walk into a crowd with vast paintings held aloft; it proved the most effective way to disseminate the word of God. It was in wall and panel painting, supposedly, where the true technical breakthroughs were made, eventually culminating in the aesthetic revolution of the Renaissance. The exhibition at Cambridge’s Fitzwilliam Museum challenges presuppositions about the inferiority of manuscript illumination in delightful and – well, colourful – ways. There is much here of interest to the psychologist. In disciplines as diverse as physics and neuroscience, scientists are recognising that medieval scholarship was more sophisticated than previously believed. Medieval thinking on the mind and brain was no exception. The manuscripts collected in the exhibition evidence an understanding of modelling – two-dimensional representation of three-dimensional forms – that predates the frescoes of Cavallini and Giotto by a good few decades. Medieval illustrators pioneered techniques such as pointillism and grisaille (the expert use of shades of grey), and showed a grasp of aerial perspective that is usually understood as a triumph of the Quattrocento. The artistic achievements of masterpieces like the Dover Bible and Macclesfield Psalter (both displayed here) were in some ways founded on scientific understandings. In the body of theoretical knowledge known as perspectiva – an eclectic mix of classical, Christian and Arabic ideas on colour and vision – medieval illumination demonstrated an invigorated understanding of optics that underpinned the advances in perception science made later by Newton and others. The visionary colour theory of Robert Grosseteste, the early 13th century scholar and bishop, is still being puzzled over by academics. The shadowy textures of grisaille may not have been conceivable without the revisions to Aristotle’s colour scale made by Theodoric of Freiberg in the early 14th century – particularly the separation of black and white to a separate scale that moderated, but did not constitute, colour. X-ray and infrared analyses show that the illuminators of that time (who included women as well as men) had access to a far greater palette of pigments – from plenteous ochres to the legendary ultramarine – than was once assumed. In one display case of many-hued rocks, the pragmatics of taking colours from the earth are beautifully described. This riot of colour also gives us insight into the ordinary workings of the medieval mind. Colour was seen a feature of an object rather than a trick of the light, and it could therefore bear meaning in ways that it can’t today. In alchemy (so important for laying the foundations of modern chemistry), colour represented elements of a cosmology. It also linked the microcosm of the human organism to the macrocosm of God’s creation. Mental imbalances like melancholy, with its excess of black bile, were literally painted on the body (as in the affecting early 15th century ‘Melancholic Man’). Colour served a practical purpose in organising knowledge, with those gorgeous initial capitals and acrostics serving useful purposes in guiding the mind through a text. Many of the books displayed here had educational functions, providing an insight into contemporary theories about the developing mind. Depictions of angels, demons and other supernatural beings help us to understand the unfamiliar logic of a thoughtworld in which the divine and the demonic were fully entangled with human affairs. The illuminated manuscript arguably reached its apotheosis in the remarkable cultural success of the Book of Hours, a fixture in a literate person’s life as necessary and addictive as a modern smartphone. The era’s technological innovations changed many things, but they did not dim the desire for colour, evidenced by the fact that some of the most brilliant works on display here were made long after the spread of moveable type printing. Light destroys colour as well as revealing it, and the Fitzwilliam’s display cases are necessarily kept quite dark. Combined with small and unfamiliar scripts, the challenge to the eyes makes the museum’s borrowable magnifying glasses very handy (they are in limited supply, though, so get in early). There is a useful catalogue book with copies chained, in a nice medieval touch, to benches for the public’s benefit. If you can’t get there in person, an excellent online resource, Illuminated, tells as much of the story as can be told from afar. The variety on display is exhilarating. From vast bibles to minuscule books of hours, from early musical sourcebooks to handbooks for combining pigments, the predominantly European exhibits range in date from early insular (Anglo-Saxon) manuscripts to the sumptuous trophy texts of early-modern princes. There are some very significant manuscripts on display here, but it may be the more mundane ones – the medical textbook showing a gruesome operation for haemorrhoids, the comic marginal touches like the energetic game of ‘kickboots’ – that will resonate in the mind. - The exhibition runs until 2 January, and is free.